From 7 to 14 February 2018, a representative of the UNPO travelled to the Republic of Rwanda on an observation mission, thanks to the support of the Nando and Elsa Peretti Foundation. The objective of this mission was three-fold: delivering an advocacy training to Member and partner organisations; meeting with diplomatic representations, development actors and civil society organisations (CSOs) in Kigali; and visiting a Batwa community. During this interesting and important mission, the UNPO observed no significant improvement in the Batwa’s livelihood, but was impressed by the continuous commitment of CSOs to enact change, sometimes with the support of international actors present in Rwanda. In the context of post-genocide Rwanda, raising the topic of the rights of the Batwa is always sensitive, and even forbidden in public spaces. However, this part of the country’s population, representing about 0.4% of the Rwandans, is today left far behind both in terms of socio-economic development and human rights. Lack of access to health services, food security, education, employment and widespread discrimination are but a few examples of the challenges facing Batwa communities. This was confirmed to the UNPO during a visit organised by the African Initiative for Mankind Progress Organization (AIMPO) to the district of Gicumbi, sector of Byumba. In a village composed of more than 50 families and 250 people, the UNPO’s representative observed that many children were undernourished and several inhabitants faced serious health problems, including AIDS. 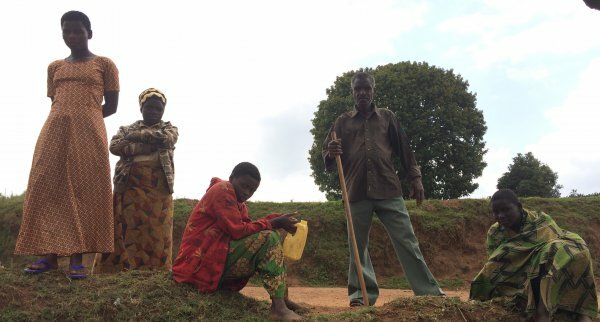 It is in this context that the AIMPO, with the support of the Canada Fund for Local Initiatives, put in place the “Integrated food and nutrition community program for historically marginalized people in Gicumbi district, Rwanda”. The project consists in the breeding of rabbits – 57 at the moment – and installation of 63 kitchen gardens in order to secure food and improve the inhabitants’ nutritional status. The rabbits are used, among others, to feed the children at school. According to the village chief, the inhabitants are happy with the project and wish that such initiatives would multiply. The village also benefits from other projects focussing on potato cultivation and sensitization to good hygiene practices. The chief stressed that education also constitutes one of his top priorities and wishes for more of the village’s youth to complete higher education – as only a handful do so at present. The UNPO believes that one of the keys for the Batwa’s living standards and overall situation to sustainably improve is advocacy. Organisations such as AIMPO and the Cultural Conservation Act (CCA, which is a member of UNPO) have been working in this field for years now, bringing their message to local, national and international bodies. In this context, the UNPO seized the opportunity of its presence in Kigali to deliver an advocacy training to seven representatives of AIMPO and four of the CCA. This one-day capacity-building session touched upon the basics of advocacy, the functioning of the United Nations system, the international framework for human, indigenous and minority rights, as well as practical tips for efficient advocacy. The training saw the active participation of all those present, who expressed their satisfaction with this “much-needed” session. During the rest of her stay, the UNPO representative met with diplomatic representations and development actors based in Kigali. All acknowledged the dire situation of the Batwa and recognised the great difficulty and even sometimes impossibility for them and for local CSOs to engage in a dialogue with the government on issues facing the Batwa and “historically marginalised peoples”. Some of them are however committed to providing support to Batwa associations, without necessarily raising the issue specifically. The UNPO recognises that the Rwandan context is a very complex one for international and national actors wishing to provide support the Batwa, due to the country’s painful and recent history. In parallel however, the government of Rwanda is praised by the United Nations for having been successful in reaching “virtually all the MDGs [Millennium Development Goals]” and by the World Bank for fostering rapid socio-economic development to the benefit of a significant part of its population. The UNPO therefore strongly encourages the government of Rwanda to offer a helping hand to the most marginalised within its people, as well as leave more space for international actors and CSOs to work effectively, in order to “leave no one behind” and let the whole population benefit from the country’s development, as required by the Sustainable Development Goals.